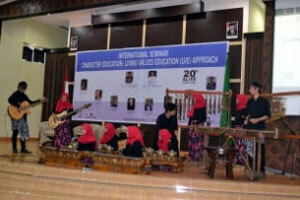 The celebration of the 20th anniversary of Living Values Education, from the 19th to 25th of November, 2016, was a labor of love of the Association of Living Values Education International (ALIVE), ALIVE Indonesia, and their partners in Indonesia: UIN Sunan Kalijaga Yogyakarta (State Islamic University “Sunan Kalijaga” of Yogyakarta), PUSAM UMM Malang (Center for Religion and Multicultural Studies – Muhammadiyah University of Malang), The Asia Foundation (TAF), Post Graduate Studies of Muhammadiyah University of Malang, and Faculty of Tarbiya and Teacher Training UIN Sunan Kalijaga Yogyakarta. First, each of these organizations are committed to promoting Living Values Education as the way to rebuild the nation’s character through education. Second, there are many educational institutions, non-governmental organizations, and even individuals that have been active in disseminating LVE all over Indonesia. 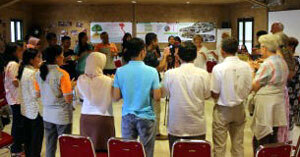 These stakeholders needed a space to exchange experiences, and this celebration was the right place for it. On the 19th and 20th, a two-day workshop for Indonesian professors hosted by FOPMAPII PTKIN was held on the Values Based Learning Model with KKNI, Indonesian National Framework for Qualification at the Atrium Hotel. On the 21st through 23rd, the main conference took place. Nineteen seminars and events were organized at the beautiful State Islamic University “Sunan Kalijaga” of Yogyakarta, attended by a total of 2,943 participants. The commitment, dedication, thoughtfulness and enthusiasm of ALIVE Indonesia and its partners was palatable in the way the conference was conducted. Hundreds of participants walked into the large conference venue daily to bright-faced volunteers and displays of LVE being implemented in different countires. 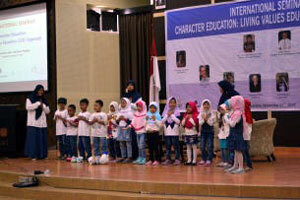 The sessions began with music, skits and songs by children engaged in LVE, and/or artistic presentations. 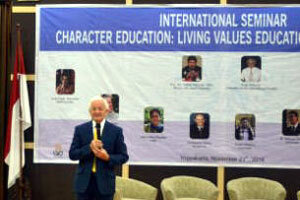 The International Seminar on Character Education: LVE Approach, was a day-long event on the 21st, hosted by FITK, ALIVE, TAF,PUSAM and UMM, with facilitators Prof. Yudian Wahyudi, M. Doddy Kusadrianto, Peter Williams, Gerardette Philips, Christopher Drake, Diane Tillman, Budhy Munawar Rachman, Syamsul Arifin, Abidin Wakano and M. Wahyuni Nafis. During the first morning, Dr. Ahmad Arifi, the Dean of Faculty of Tarbiya and Teacher Training, presented elegant commemorative gifts from State Islamic University to each Focal Point for LVE or ALIVE Associate from the ten countries presented. ALIVE members who attended the conference were: Peter Williams, ALIVE International President, representing Kuwait and the United Kingdom; Diane Tillman, Primary author of the LVE series of books, President of Living Values: An Educational Program, Inc., USA; Christopher Drake, Past President of ALIVE, President of Living Values Association, Hong Kong; Shahida Abdul-Samad, Focal Point for LVE in Malaysia: Roger Miles and Suzanne Stallard, Co-Focal Points for LVE in Australia; Bich Ha Nguyen and Lain Van Anh, Directors with Living Values Reserach and Consultancy Center, Vietnam; Sophie Fried, President of Belso Ertekeinket Kibontakztato Egyesule, Hungary; Hendrina Khanyile, Representative of Living Values Association of South Africa; Chamroeun Chim, Acting Focal Point for LVE in Cambodia; and Philip Yusenda, Director with Indonesia’s ALIVE Associate, Yayasan Karuna Bali. Dr. Arifi presenting a gift to Cham. Suzanne, Iluh, Sophie, Ha and Van Anh are in the background. Dr. Arifi presenting a gift to Philip. Peter, Chris, Suzanne and Raj are in the background. Wayan and Iluh Rustiasa and Taka Gana. Wayan, Taka and Iluh talking with Sophie. Wayan and Iluh are co-founders of Karuna Bali. International Seminar on Values-Based Learning for Wonderful Children hosted by Elementary School Teacher Training Program, with facilitators: Diane Tillman, Christopher Drake and Taka Gani. International Seminar on Leadership and Management: LVE Perspective hosted by Islamic Education Management Program with facilitators: Peter Williams, Shahida Abdul Samad and M. Wahyuni Nafis. Seminar and Movie Discussion: “Jihad Selfie” hosted by FKMPM FITK with facilitators: Budhy Munawar Rachman, Rifah Zainani and Anis Farikhatin. Seminar Parenting with Love and Peace hosted by Kindergarten Teacher Training Program with facilitor: Rani Anggraeni Dewi. 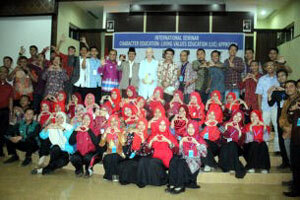 Seminar on LVE Approach of Character Education hosted by Kindergarten Teacher Training Program with facilitor: Philip Yusenda, Wayan Rustiasa and Roger Miles. Workshop on Peace Education hosted by Young Interfaith Peacemaker Community (YIPC) Indonesia with facilitator: Riston Batuara and Team YICP. 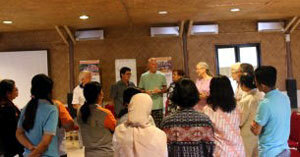 Capacity Building for Staffs of UIN Sunan Kalijaga – Faculty of Social and Humanities with facilitator: Rani A. Dewi. Capacity Building for Staffs of UIN Sunan Kalijaga – Faculty of Tarbiya and Teacher Trainingwith facilitator: Yudhi Widyantoro. 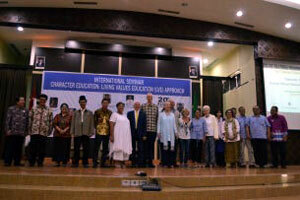 International Seminar on Islamic Education: Outsider Perspective hosted by Islamic Education Program with facilitators: Elsye Syauta Latuheru and Sawyer Martin French. Cultural Speech on Values Based Language Studies hosted by Arabic Language Education Program with speaker: D. Zawawi Imron. Public Lecture on Nurturing with Love and Respect: Contemporary Context hosted by Elementary Teacher Training Program with facilitators: Diane Tillman and Taka Gani. Seminar and Movie Discussion “Peace Provocateur” hosted by Student Council of Islamic Religious Studies Program, with facilitators: Elsye Syauta Latuheru and A. Wahyuni Nafis. FGD Share and Reflect LVEP in School hosted by Kindergarten Teacher Training Program and Islamic Religious Studies Program with facilitators: Taka Gani, Peter William, Bahrissalim, and Nida Nidiana Tolibin. LVE Workshop For Teacher and Principal hosted by Muhammadiyah Schools Council Yogyakarta with facilitator: Christopher Drake. LVE on the Street was enacted by student volunteers from UIN Sunan Kalijaga around the campus of UIN Sunan Kalijaga, Wednesday 23 Nov 2016, 09.00-16.30 during the graduation day. 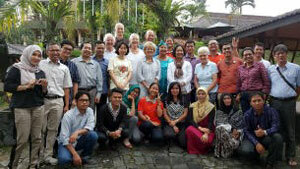 Happinness Yoga with Yudhi Widdyantoro at the yard of Tarbiyah Building. Cultural Show and Values Based Poetry Musicalisation Competition hosted by Islamic Education Management Program at FITK Yard Stage. A bouquet of thanks to the Directing Team. Your love and joy was beautiful. Your values are creating a happier and more peaceful world for so many. Directing Team: Dr. Muqowim, UIN Sunan Kalijaga Yogyakarta; Philip Yusenda, ALIVE Indonesia; Prof. Dr. Syamsul Arifin, PUSAM UMM Malang; and Budhy Munawar-Rachman, The Asia Foundation; and the Committe: Sylviana Sianipar (TAF), Zuhrotun Nisa (YIB), Mochamad Ziaulhaq (ALIVE Indonesia), Ariestin Ramadhani, Nafi Muthohirin, Rizky Elok Kusuma and Hasyim Musthofa (PUSAM UMM). During the ALIVE General Assembly, Peter Williams, who has led ALIVE with so much love, integrity and enthusiasm for the last five years, stepped down as President. In addition to gaining several stellar new board members, Hendrina Khanyile from South Africa, Roger (Raj) Miles from Australia, and Dr. Budhy Munawar from Indonesia, Chris Drake graciously astonished us all by accepting the mantel of President for ALIVE for the second time. One: In the parenting workshops, it was emphasized that methods of nurturing children will not be effective if parents are not aware of their values. Parents with values awareness will have better self control and be able to build more positive and healthy relationships with their children. Parents and children can learn from each other. As Diane Tillman put it, “Education is the most powerful weapon you can use to change the world.” (Tillman, 2014). 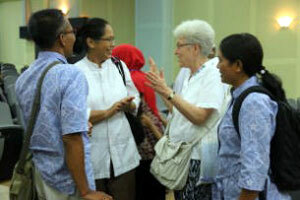 Two: An interfaith peace education is essential to stimulate peace within the very diverse Indonesian community. LVE has a very strategic role in raising people’s awareness of common values shared by all parts of Indonesian society, in order to strengthen unity of Indonesia. Three: Indonesia already has a good model of LVE development for conflict resolution and post conflict trauma healing, as developed in Ambon area. Four: Currently, some of us have deep internal dissatisfaction, due to only knowing the thin outer layers of life. There are many unanswered questions, such as Who Are We, What’s Our Purpose, and What’s Our Role in this world. LVE emphasizes that life has meaning, so each educator can encourage individuals and communities to define their meaning. Like a heart, education encourages each person to understand life to be able to nurture humanity. Five: The success of combining LVE methods with Islamic education system in a number of madrasah or boarding schools has been proven through the behavioural changes and academic achievements. This success makes it possible to propose this model to Islamic Development Bank in order to a reach wider audience. Six: Each ALIVE Associate / Focal Point for LVE needs to continuously develop learning models that fit the social and cultural context of their country. These models will need a way for planning and evaluation to ensure the lessons from implementation can be learned properly. Seven: Each ALIVE Associate / Focal Point for LVE must be able to facilitate their trainers and facilitators to understand and be responsive to the current political, social, economic, educational and humanitarian discourse that is alive in their country. This will enable their trainers and facilitators to deliver a contextual reflection on values to their audience. Eight: LVE trainers and facilitators will need to increase the number of books and international journal submission to disseminate LVE on a wider scale globally, especially among education stakeholders. The July 2014 LVE European Conference on the Greek island of Zakynthos Over 70 delegates, from near and far, gathered on the beautiful island of Zakynthos to share their best practices. The 100+ pages proceedings echo the excellent Living Values Education creativity, learning and research that uplifts our understanding of 'Ancient Wisdom for Modern Times'. Special congratulations are well deserved to Xanthie, Anda and the organizing committee who welcomed and hosted everyone so well. Helen Sayers from Oman who shared methods of how to get to know one another in very creative ways, how to sustain alertness through the 'Rain Dance' and how Ubuntu is being very well received. Cecile Lecomte from Reunion Island shared how the program on the island had reduced negative behaviours to positive behaviours to such an extent that the French government has recognized the outcomes as very good practice on their website. The creation of a 'Values ruler' indicating the degree to which student's learning is understood was very well received. Marlies Ludding Van Loon from the Netherlands shared how Living Values Education is growing particularly in Primary Schools and Marjo shared how Living Values Education is used by Foundation OneMelodie in helping children from different cultures and adults to strengthen their dignity. Marjo presented also the children project 'ToGether' for children from 6 – 12 years old about self esteem and values of life. 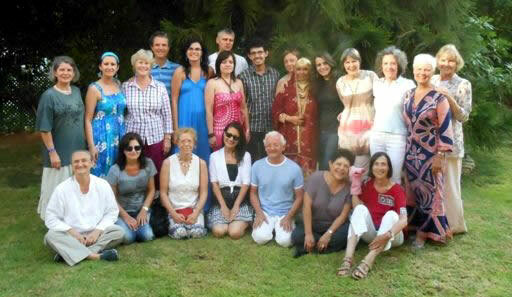 This program will be performed in close cooperation with Living Values Education Netherlands. Frances Burkhalter from Switzerland shared her enthusiastic program called 'Onions and Diamonds' with practical techniques of how to help transform character with the help of energetic warm up and confidence building techniques; and Patricia Tamburrino, also from Switzerland, added to the august occasion by sharing practical techniques and success stories to uplift us all. A particular highlight of the conference was an evening session at Zakynthos Library that houses many values stories and conducts evening programs for students who wish to know more about values. Since the 2014 European gathering, Living Values Education continues to grow from strength to strength in Greece and within Europe. You are most welcome to read the proceedings and to use/ adapt them to your own setting, to contact our International colleagues directly – and, of course – share your own stories with the Living Values Education family.